The Edward Jones Dome has been home to the St. Louis Rams since 1995. The Rams supplied a 29-page “statement of reasons” to St. Louis Public Radio and, presumably, other local and national media outlets. In essence, the document lavishes praise on St. Louis Rams owner Stan Kroenke’s plan to build a largely privately financed stadium in Inglewood, Calif. And it also trashes a roughly $1 billion stadium proposal on the St. Louis riverfront and the Gateway City’s ability to retain a NFL team. Bolstering the Inglewood project is a necessity for the Rams to secure the 24 votes from NFL owners needed to move, especially since the San Diego Chargers and the Oakland Raiders have a competing proposal in Carson, Calif. (A vote on the matter could come next week.) The Rams’ statement says the stadium would be the largest in the NFL, with additional facilities built for the league’s media officials and for its annual draft. As the document goes on, the Rams contend they made a good faith effort with state and local officials to revamp the Edward Jones Dome. The team proceeds to accuse policymakers of trying to wriggle out of a clause in a lease that requires their stadium to be “first-tier,” which has a been a topic of controversy ever since the Rams moved to St. Louis. The document then turns its ire to the roughly $1.1 billion riverfront stadium proposal, which includes funding from the NFL, the Rams, the state of Missouri and the city of St. Louis. In bold letters, the Rams state unequivocally: "No NFL Club Would Be Interested In The RSA’s New St. Louis Stadium." Among other things, the document highlights that the NFL and the Rams would be on the hook for the majority of financing and that the public contribution is less than what was advertised by a two-person task force late last year. 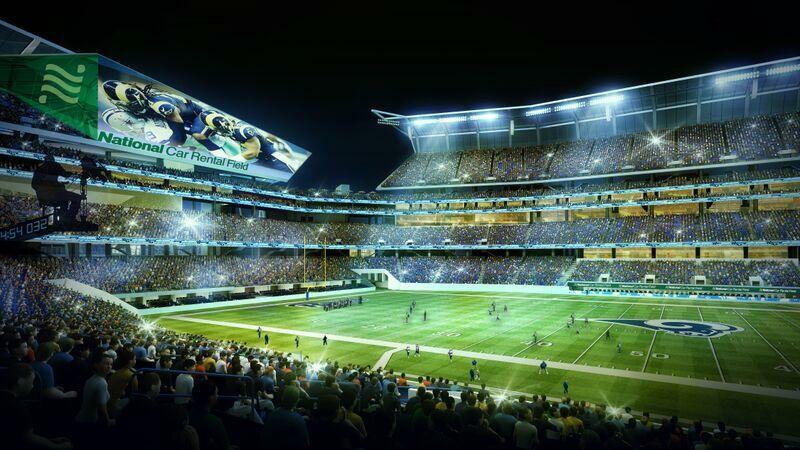 It also criticizes how the plan shifts stadium operations and capital expenditure costs for the stadium to the Rams and also hikes the team’s rent. Dave Peacock, a member of the governor's two-person task force, has been the public face of the new stadium effort. Reaction to the Rams' document was swift and very, very angry. By Wednesday, hundreds of people were making fun of the application on Twitter using the hashtag #kroenkecomplaints. And at a press conference in St. Louis County, Gov. 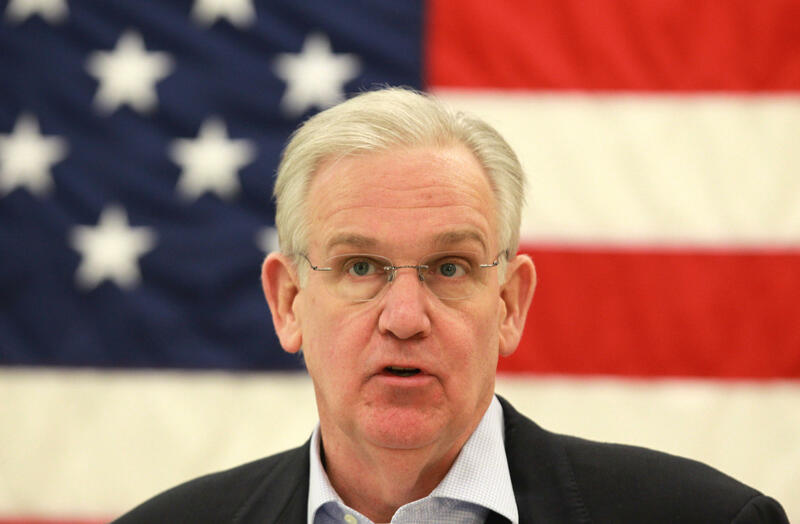 Jay Nixon openly mocked the idea that the proposed riverfront stadium would lead to financial ruin. Missouri Gov. Jay Nixon was dismissive of the Rams' 29-page document explaining why the team wants to relocate to Los Angeles. "When you talk about financial ruin, you generally don’t think about NFL owners," Nixon said. "They seem to have risen to a position to take that away as a life risk. Most of them seem to be doing just fine to me under any objective standard. I don’t have the exact balance sheets of all of them, but they seem to have at least one extra comma in their net worth to pretty much everyone that’s here. "We remain confident that with a full and fair hearing, the NFL owners are going to continue to recognize that St. Louis is a world-class city and NFL city for years to come," he added. St. Louis County Executive Steve Stenger said in a statement that Kroenke's assertion "that the St. Louis area lacks the economic vitality to support a pro football team is demonstratively false." And during an appearance on St. Louis on the Air, St. Louis Mayor Francis Slay contended that the document smacked of desperation. "When you think about what he's trying to do, he's trying to I think in an exaggerated way make a case for moving his team to Los Angeles," Slay said. "I'd rather blame the Rams for an unimaginative offense than to blame them for the harsh words of a sales document that we see in there. ... Based on the way he's approached this, his ability to move the Rams to LA is a long-shot. And this is his attempt at a hail Mary pass." Indeed, as of right now, it may be difficult for Kroenke to secure enough votes to relocate unless the Rams and the Chargers come to an agreement to share a stadium together. And, considering that Chargers owner Dean Spanos cited Kroenke’s Inglewood overtures as a rationale for his team to apply for relocation, that doesn’t seem like a likely scenario. 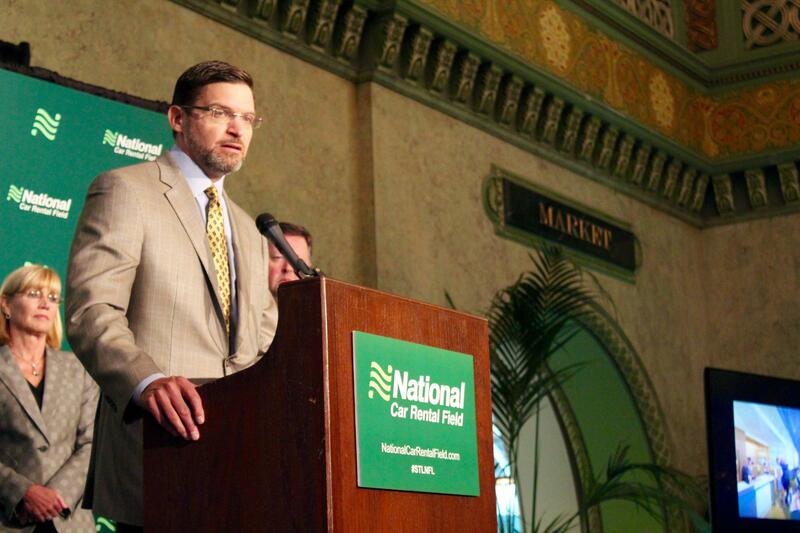 These renderings show what it would look like in National Car Rental Field. To get built, the riverfront stadium would require $300 million from the NFL and $250 million from the team’s owner. While nothing is hypothetically impossible, it doesn’t seem like a realistic proposition that a team that just declared “no team would be interested in the RSA’s new St. Louis stadium” would turn around and agree to the proposal’s terms. Here’s why that matters: Much of the state’s portion of the stadium funding comes from bonds that Nixon’s administration want to issue without a legislative or statewide vote. But members of the riverfront stadium task force have publicly stated that those bonds won’t get issued without a team signing onto the terms of the financing plan. Meanwhile, roughly 140 members of the Missouri House and Missouri Senate have signed letters opposing issuance of state debt for the stadium without a statewide or legislative vote. And assuming Kroenke sticks to his guns and doesn’t sign onto the financing plan right away, there’s now plenty of time for the legislature to pass a bill (and override a veto) barring Nixon from issuing stadium bonds by fiat. For his part, Slay said it may be too soon to predict how the state legislature will respond if Kroenke's relocation bid is rejected. "There’s a lot of spokespeople on behalf of the state. So you have to be very cautious when you hear statements coming out of the legislature – whether it’s one person writing a letter or a few people making public statements," Slay said. "I can tell you this: Gov. Nixon has been a very staunch leader in this approach to do what’s right for the state of Missouri and for the city and the region itself to try to keep what I think’s real important: Having a NFL team in our city." Durrie Bouscaren contributed to this article. Updated 11:15 Friday -- Plans for a $1 billion riverfront stadium cleared a major hurdle Thursday when a financing proposal passed out of the St. Louis Board of Aldermen’s Ways and Means Committee. And the measure passed with a big assist from one of St. Louis Mayor Francis Slay’s biggest detractors. The full board will consider this bill next week.